Caroline Leaf is on the nutritional warpath. Our society isn’t the best when it comes to eating right. Fast food and junk food are more attractive options than fresh food, and nearly everyone knows it. Today, the internet is flooded with celebrity chefs and self-titled experts attempting to leverage some profit by advocating their own brand of diet or herb as the simple solution to what is a deceptively complex problem. Dr Caroline Leaf is a communication pathologist and self-titled cognitive neuroscientist. In recent times she has also jumped on to the nutritional bandwagon, advocating organic gluten free recipes through food-selfies, and reposting Jamie Oliver quotes. 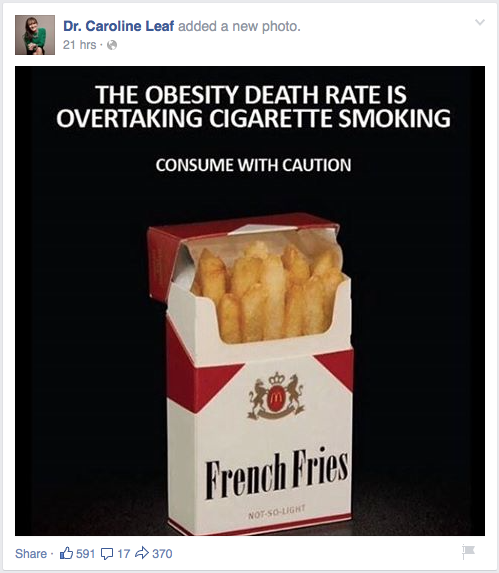 Today’s meme follows a similar line, where she has reposted an image which fits with her personal cognitive bias – a picture of french-fries in a cigarette packet, accompanied by the tag line, “THE OBESITY DEATH RATE IS OVERTAKING CIGARETTE SMOKING. Consume with caution”. The image is a case study in overstatement. According to the most recent Global Burden of Disease data (currently 2010), the death rate associated with cigarette smoking is currently 91.4 per 100,000 population while the death rate associated with a high BMI is only 48.1 per 100,000 population. Even extrapolating the figures to the current year, the predicted rates would still be 89.1 vs 51.9 respectively, which are still a long way apart. 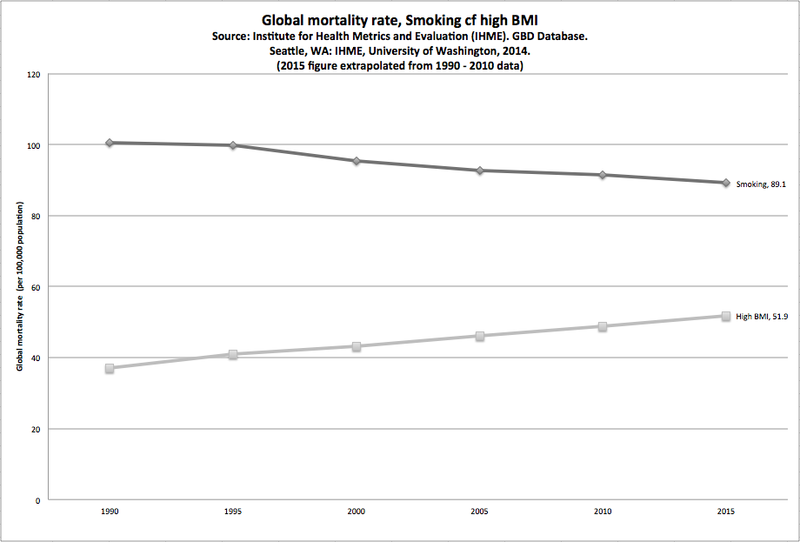 On the current trends, obesity won’t overtake smoking as a global cause of death until 2055. So saying the obesity death rate is overtaking cigarette smoking is like saying that Christmas is coming – it’s technically true, but it’s still a long way off. There are a couple of reasons why deaths associated with obesity are rising while the deaths associated with cigarette smoking are falling. The most obvious is that cigarette smoking is decreasing, but treatments for smoking related illnesses are also concurrently improving, so less people are getting sick from cigarette smoking and those that do are less likely to die. Of course, it’s no secret that more people, especially in the western world, are getting fatter. The old assumption was that obesity contributed to metabolic syndrome which then caused heart disease and type 2 diabetes and a concomitant rise in deaths. However, new evidence casts serious doubt over these assumptions. In a meta-analysis of the association of mortality to BMI, Flegal, Kit, Orpana, and Graubard (2013) showed that overweight people have a slightly lower death rate than normal weight people, those with mild obesity have the same risk of death as normal weight people, and that the overall risk of all classes of obesity was small (relative risk 1.18 (95% CI, 1.12-1.25)). As a comparison, the risk of death from cigarette smoking is up to 2.66 (Shavelle, Paculdo, Strauss, & Kush, 2008)**. The key to understanding this paradox is found in another meta-analysis, by Kramer, Zinman, and Retnakaran (2013) They showed that obesity and metabolic dysfunction are separate entities, with metabolically healthy obese people having the same risk of death as metabolically healthy people of normal weight (RR 1.19 (95% CI 0.98 to 1.38)) while metabolically unhealthy people with a normal weight had a risk three times that (RR 3.14 (95% CI, 2.36 to 3.93)). So the key isn’t whether someone’s obese or not, the key is whether someone’s metabolically healthy or not (which is another blog for another time). According to the latest scientific evidence, the obesity death rate probably isn’t related to obesity after all. Dr Leaf might be on the nutritional warpath with the right intentions, but her lack of expertise and willingness to fact-check is showing with every meme. If she wants to continue portraying herself as an expert in the area of food and nutrition, she needs to move away from her personal biases and start promoting proper science. Shavelle, R. M., Paculdo, D. R., Strauss, D. J., & Kush, S. J. (2008). Smoking habit and mortality: a meta-analysis. J Insur Med, 40(3-4), 170-178. ** This means that a smoker is more than twice as likely to die compared to a non-smoker, but an obese person’s risk is only about one fifth more likely to die compared to a person with a normal body mass index. This entry was posted in Biological, Caroline Leaf and tagged all-cause mortality, BMI, caroline leaf, cigarette, diabetes, dr caroline leaf, global burden of disease, Jamie Oliver, metabolic syndrome, nutrition, obesity, smoking by cedwardpitt. Bookmark the permalink.